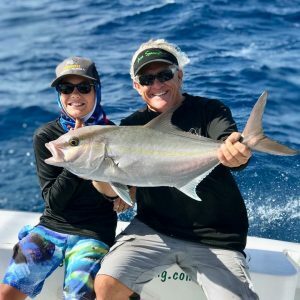 On Tuesday, May 1st, Patrick Utter, owner of Shenanigans Sports Bar in Hollywood and Shenanigans Eastside Pub & BBQ in Dania Beach, booked a fishing trip on the opening day of grouper season. Patrick brought along his 10 year old son Matthew, Jeremy Partridge, who has worked side by side with him for 26 years, Dale Salkeld and Bobby Sims. Although the day did not go as expected, it was still an amazing day of fishing that ended with a nice catch and a pleasant surprise. Capt Dennis and mate James Baker headed out to sea intending to catch grouper, however, the grouper were not biting that day. Instead, Patrick’s son Matthew reeled in a large almaco with live bait that was intended for the grouper. 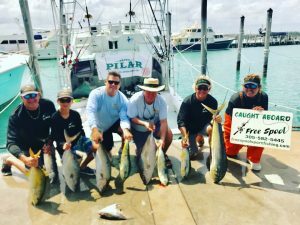 The group ended up bringing in a nice catch of almaco, yellow jack and several dolphin. After the trip, Patrick invited everyone to his Shenanigans Eastside restaurant. Once at the restaurant, Chef Craig Whyte, who has also been with Shenanigans since they opened, went to work to turn the day’s catch into a fabulous meal of dolphin francaise, one of his signature dishes. All in all, a great day of fishing ending with a delicious meal!